FLSA Simplified for Managers is a comprehensive training program that clearly guides you through everything you need to know about FLSA requirements, with answers to all your questions. Why is FLSA compliance important? How does a company comply with overtime rules? What are the requirements and limitations of non-exempt employees versus exempt? This training program has specific guidelines that will educate managers on how to properly meet FLSA guidelines. You choose how to deliver your training. You can purchase the training program with audio narration or choose to deliver the training yourself and purchase the option with no audio. If you opt for the non-audio version, there is a blank slide at the end of the presentation that can be used to include specific company information. If you have a lot of information to share, you can make multiple copies of the blank slide and place your new slides anywhere throughout the presentation - making it completely your own. 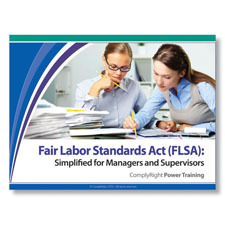 You may also be interested in Fair Labor Standards Act Power Training for Non-Exempt Employees. 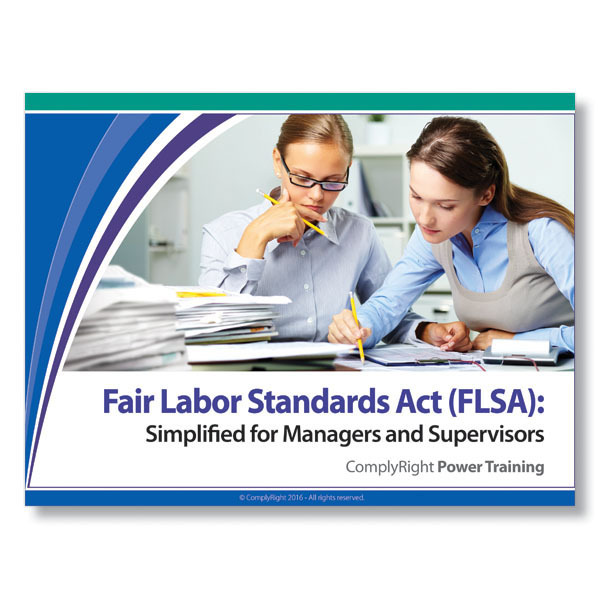 Fair Labor Standards Act (FLSA) Power Training Program For Managers and Supervisors is part of the ComplyRight Power Training Library of HR Compliance topics.